Towards the end of October i decided that the Indian runners i had been using with Pogo were really not helping us with our training. I had been told by everyone that Indian runner drakes were the duck for the job so to speak. The only trouble is no one told me how nervy, neurotic and flighty they are which can mean that they excite the dogs. As you can see from the previous photos i have posted on this page they were a colourful lot but it was time for them to go. So they were offered a home as pet ducks with a unused paddock to run around which would be heaven for them. The hunt was then on for the next set of ducks and i decided having had Khaki campbells before i thought a Khaki cross indian runner would be a good middle of the road duck. I know other duck herders that use this cross as they herd together well but are not quite as fast as a pure indian and are a little less neurotic. After some searching i thought i had found some but there was only two drakes and i really wanted three. The reason duck herders use males only is that the egg can break in the female if they are running around a lot and result in the bird dying. Eventually i found some Aylesbury cross indian runner which are all white and as a bonus all from the same hatch which is meant to mean they stick togther even more. I was a bit worried about having a part Aylesbury as some information say they are noisy but whether its because they are a cross these ones are the quietest ducks i have had. 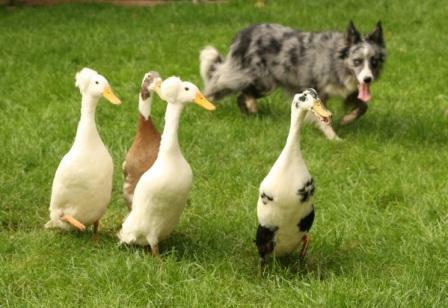 The ducks were used to dogs walking around as there was some on the farm where they lived so the only thing they can panic about is when a human goes towards them. 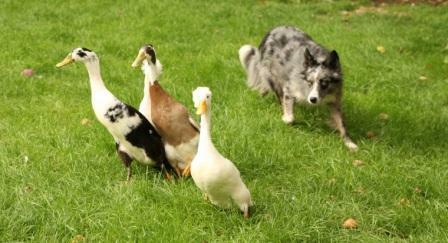 Early indications seem to show that these might be the best ducks for herding that i have had. They are slightly slower as they are a bit heavier which gives you time to think when working the dog. Also Pogo is not the fastest so she can get round these with ease. Being part Aylesbury they also have a thicker leg and their body is more dumpy which hopefully means unlike the pure indian there will be less leg problems which you can get with the pure up right indian runner. 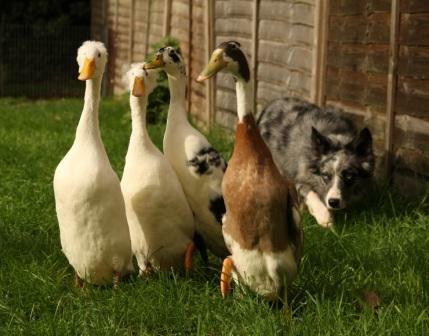 Whizzy has had a go with them once but im not sure she is cut out to be a duck herder as she can be a little eager to play with them ! so i think for the moment i will concentrate on using them to keep Pogos training up together. Here are a few quick photos that were taken of Pogo and her feathered friends doing a bit of practice. You may have read some of the updates on the k9 freestyle blog regarding Pogo and her sheepdog training. She has been a little up and downin her training especially when it comes to her lessons with the sheep. I am still trying to find some land locally where i can keep my own sheep so that we can practise a little more. At the last lesson she was a lot better than the time before and almost stopped when i told her. She is a bit pushy and likes to drive the sheep towards me quite fast. He main problem is that she doesnt keep a long distance off the sheep which would settle them better so we keep working on getting her to keep back. At the end of June i got myself four indian runner ducks as everyone tells you these are the best for herding work as they keep together like sheep. Well compared to my other ducks these are very fast which doesnt give you much time to think. After working with them for a few months they are starting to settle but i think i prefer working with the slower ducks as i feel more in control. 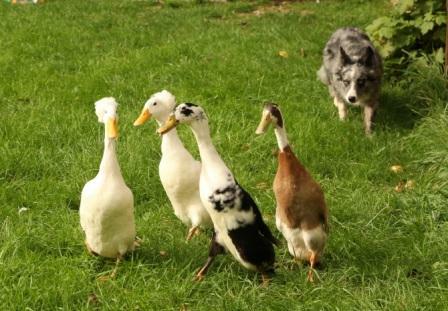 I think not all of these indian runner ducks are cut out for herding as one has a problem keeping up with the others and another is a getting a bit bolshy and can make a run for it sometimes. Im still having great fun with the herding work and am really looking forward to the time when i can practise more myself with my own livestock. Having done well in the sports of obedeince and freestyle i am always looking for the next challenge which i think this is. At my last lesson with Pogo i decided to see if Whizzy could get in touch with her inner collie. As you can see from this video kindly produced by Andy Nickless - www.workingsheepdog.co.uk Whizzy at first was a bit scared by the sheep but after a while got into the idea this was a fun new game. I promised Pogo that I would her her a present if she did well at Crufts so as she did do so well when I got back from Australia I took on two ducks. It was quite a scary experience when I took them out with Pogo with them for the first time as I wasnt too sure if I would be able to get them back into their travel crate again. Anyway I am glad to say that it seems to have really helped her sheepdog work as it now means we can do a bit of practice in between our lessons on the sheep. Our last lesson on the sheep was quite amazing as Pogo worked the best she had ever done which gave me an added boost. Over the last month we have had another two lessons at Andy’s place in Worcester where Pogo has had her good moments and bad. It amazes me to see how powerful and confident she is around the sheep when I think back to how submissive she was as a puppy. Although Andy is very encouraging, I still have been find it frustrating that Pogo will circle the sheep and one minute she is fine then in the next minute she has the odd nip. When I say a nip it is just that, not like other dogs I have seen working sheep who come away with mouthfuls of wool. So this was one thing that is bugging me as I don’t feel at all in control when I am away from the sheep. According to Andy I shouldn’t be concentrating on this but more on getting her to stay further away from the sheep when she circles. He keeps telling me how far back he wants Pogo in relation to the sheep and I kept thinking how the hell do I do that ! So anyway the lesson started ok with Pogo rounding up all twenty odd sheep and placing them into the yard so that we could use a smaller bunch. It was good to do a “job” with her rather than just moving around the field as I think it gave me something to think about rather than worrying if she was going to go in too close. Then I started working with her but still she came in too close and to be honest I don’t think she was listening to me at all. This went on for a while and just as you think you have made some progress she would then do something stupid like chase one sheep that broke away. A rethink was needed at this point and Andy suggested a noise aversion to try and mark when she was in too close thus hopefully getting her to stay out further. I might be ok at timing when im training obedience/tricks but my timing of praise etc in these lessons is not brilliant. As Andy says he can see when she is going to go in too close or have a nip and would have said ah ah at that point not afterwards which is what I feel I am doing. So we gave the noise aversion a try and it seemed to work with Pogo staying much further away than she ever has. Now this was towards the end of the lesson when she was a bit tired so I will be interested to see how it works especially when she is in turbo Pogo mode at the start of a lesson. Anyway we are having fun at our lessons and its still good to do something other than our normal sports, I’m just hoping Pogos last school report of “ could do better” can eventually be improved on ! After a bit of a break due to the snow and then Crufts it was great to get Pogo back into some sheepdog training with our ever patient trainer Andy Nickless. As it had been a few months since we had been training i thought that Pogo might be a little full on. She certainly came out with all guns blazing and took a while to settle down. When she had got the initial excitement out of her system we started to try and get her to perform some small outruns. It certainly is an advantage to have done some previous obedience training which meant that Pogo would lie down and wait while i walked down the field ready to send her off. Just like in freestyle where the dog prefers twisting in one direction, the dogs can favour one direction when circling the sheep. Pogo tends to go out a little wider when she goes anti clockwise and a bit tighter on the clockwise direction so we worked more on her clockwise outrun. She started to perform some really nice short outruns which i was quite pleased with especially when i got my down command in at the right time. Teaching a beginner sheepdog i think should become the new weightwatchers scheme as you dont realise how much running around their can be. Then you have to be so on the ball as the dog and the sheep do things so fast and i find myself standing there not saying a thing sometimes when i should be doing something. Also why is it when i have the Pogo behind the sheep coming towards me and i am back off i cannot seem to keep ahead of the sheep. A few times in this lesson i was almost knocked over by the sheep who pefer to stay with you as they learn thats the safest place to be. Saying that its all great fun and Andy seems pleased with the progress that Pogo is making. As i have said before its nice to do something different with Pogo without the pressure of competing but i have to say the dog trainer in me still has that feeling of her wanting to do better. I suppose its just the same feeling i get when i teach Pogo a new move, im always searching for that "dog training drug" which is the feeling when the dog has done something you have trained it well for the first time. Now that winter is gone im hoping we can get back into doing some more regular training. I keep promising Pogo if she is very good she might just get a extra special birthday present which will mean we can practise to her hearts content! A couple of weeks after our first one to one lesson I was back for a second lesson at the end of November. As I had been away teaching in Denmark Pogo had not had the same exercise as she normally does so I was expecting her to be a little full on at the start of the lesson. As Andy penned the sheep up so that there was just a small group, I made sure that I just made Pogo aware that even when the sheep were about she still had to listen to me. I got her to do some heelwork and a few tricks but mainly just to be attentive to me when the sheep were about. I know you never want a good sheepdog to take its eyes off the sheep but as she was not working the sheep I still wanted to make sure I had some control. Pogo started off well and was not as ballistic as I thought she might be. Her main fault is that she can come in too close to the sheep so we started off trying to get her to stay away from the sheep. The white stick you might have seen in the video is helpful for this, not I hasten to add to hit the dog but just to extend your arm to wave it at the dog to stay out. She was a little naughty as she would go out wide then as she gets behind the sheep, she still runs round but comes in a bit so she can have a little nip if she feels like it. While working her, the sheep decided to get into some thistles on the banks of an old filled in pond. Well Pogo was not keen about going into the bog to get them out and it took a while to get them moved, I’m not sure how much it was her or me who got them moving. Next it was time to get her to move behind the sheep as they were coming towards me. This was when I had noticed last time I didn’t move very quickly as the sheep always would seem to run past me. So this time I made sure I moved back faster and tried to stay calm, getting Pogo to go into a down to prevent her getting too close. On the whole she had a good session and I felt much more in control than I did last time. Now its really just repetition it seems to get her to give the sheep some distance. Its so amazing to see her working the sheep, I still cannot believe she is doing it. Im enjoying it as well as it is something totally different from any sport I have done before and already I can see how doing this with her has in fact improved our relationship even further. Having had such a good time with Pogo on the last course I was looking forward to the lesson. Andy is a very patient and calm teacher so I was glad to have his experience on hand. When you have never taught something before you don’t know if you are doing right or wrong so Andy was able to tell me where I should be. Now you might think it looks quite sedate wandering around a field with a dog herding the sheep, it doesn’t look like you have to do that much well in training a sheepdog that’s totally different. I must admit after that first half an hour session I was thinking where had my lovely under control sheepdog that I had worked on the taster day had gone as Pogo was like sheepdog possessed. After a short rest we got the sheep back for another session. This is where Andy tried to calm a rather panicky handler’s voice and movement down to see if that helped. What I haven’t mentioned yet is the fact that I feel its human nature not to want your dog to touch the sheep in anyway. So when the dog does nip or rush off after a sheep the inexperienced trainer in you panics and you start shouting down in a louder voice and running around to stop the dog. That is where it’s good to have an experienced trainer on hand who can tell you that’s all normal for the first time really on sheep. So after taking a deep breath I set off again and this time she was so much better. The calmer voice and body movements conveyed to the dog so she worked well, the stupid thing is I tell handlers the same thing in HTM bu t of course when you are in the situation you cannot see it. By the way if you are a teacher of anything I totally recommend learning something that you have never done before as it gave me a new insight into what it must be like for a new handler coming into the dog sports I teach. Then Andy told me just to stand still and not say anything to see what she did. Having circled the sheep and stopped I was told to walk off to see whether she would balance herself behind the sheep. Upto this point I felt that Pogo was just doing what I told her ie run clockwise lie down etc and unlike Andys dogs she wasn’t really naturally balancing them. So as I walked off it was amazing to see her move around of her own volition, staying behind the sheep which I hadn’t really been able to do when I talked to her. As with all training sessions you should finish on a high so I was more than happy to put her on the lead and leave it until another day. So what did I learn from this session well firstly I think I should write out a hundred times “ I must stay calm” before the next lesson! secondly no matter how much training you have already done with your dog when that natural instinct comes out its previous training can go out the window. Above all though I think I saw just a glint of a sheepdog in my little Pogo which made me very proud. For as long as I have had Border Collies there has always been one thing which I wanted to do with them but I have never had the chance to fulifil that goal as to train a sheepdog you need sheep ! I had often wondered if my blue merle collie Pogo would be any good at sheep work as she would often take an interest in livestock but I had never let her off to see as you don’t know what will happen. When Pogo was about three I looked into starting sheepdog work a bit more but the people I contacted or spoke to all tended to say that she was a bit old or I needed my own sheep, not exactly encouraging. Its also very hard to find anyone who does sheepdog lessons at beginners level and even more harder down where I live in Southampton. So as my initial enquires didn’t result in anything it wasn’t until I found another website www.workingsheepdog.co.uk which was advertising a new training dvd for beginners that I started to look at sheep work again. I was thinking that if I got some experience then when I got a new pup I would start that one off doing some sheepdog work but that might not be for a couple of years. Anyway I ordered the dvd to gain some more knowledge and it was very beneficial as it showed new dogs starting off and most importantly showed what happened when it is going wrong. After watching the DVD I went back to the website and to my delight they were advertising beginner sheepdog days in Worcester which were basically where you to go along and see if your dog was interested. It said that it didn’t matter what age the dog was so in a moment of madness I paid for a place with Pogo. I was really looking forward to the day as it make a change to be a student on a course but I was a bit cautious as Pogo had never been off lead near sheep before and with her previous obedience / trick training I thought she might not do anything. I thought it best not to mention the fact Pogo was four and a half as when I had mentioned this to other sheepdog trainers they basically had said no chance. Andy Nickless a sheepdog trainer was taking the day and we each started off by getting into a pen with the dog and sheep to see what they would do. Now I know that whatever dog sport you do there is always a cross over of skills as any dog related activity benefits from good obedience. Pogo has competed and won in obedience as well as Heelwork to music so I knew at least when I said down she would do it. What I didn’t know was that where I have taught her to run in a big circle clockwise and anticlockwise on command for HTM that this would transfer so well onto the sheep. After a couple of sessions in the pen Andy told me to that I could try moving the sheep around the paddock which was a little scary as up to this point she had been a sheepdog for about ten minutes in total. Well I couldn’t of asked for better and im sure many of the other students as well as Andy didn’t quite believe this was her first time on sheep. Whenever you do well at something its like someone giving you a big reward so with Pogo doing so well I was eager to have another go.